© Todd Horton. All Rights Reserved. 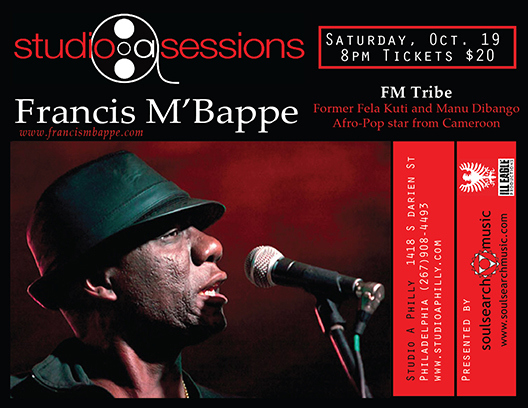 The second artist presented in the "Studio A Sessions" series will be renowned bassist, songwriter and vocalist Francis M'Bappe from Cameroon, West Africa with his band FM Tribe on Saturday, October 19 at 8 pm. His New York City based group, with its cross-pollination of funk, jazz, soul and West African music, has been packing NYC venues and performing in festivals worldwide for nearly twenty years. Francis was once bassist for the Nigerian legend Fela Kuti, bassist and musical director for Camerounian star Manu Dibango for nearly ten years, performed with Herbie Hancock and appeared on the renowned "Waka Africa" album with Peter Gabriel, Youssou N'Dour, Salif Keita and King Sunny Ade. After moving to NYC in 1990 he created a revolutionary sound with multiple releases, featuring some of the most exciting and innovative players on the scene.